As hundreds of thousands of people take to the streets in efforts to resist Donald Trump, Professor Erica Chenoweth has been obsessed with one question: How many people exactly? Erica Chenoweth is one the leading scholars on authoritarian regimes and how to overthrow them. In her book Why Civil Resistance Works, she compiled 323 cases of nonviolent and violent campaigns in order to assess which were more successful in achieving their stated goals of regime change. Much to her surprise, Chenoweth discovered that nonviolent campaigns were nearly twice as effective as armed campaigns over the past century. Chenoweth says the most effective variable in toppling a dictator is the number of people participating in a movement. Chenoweth argues that many more people—and more diverse groups of people—participate in nonviolent campaigns than in activities perceived to be violent. She concludes that this means nonviolence is not merely a moral choice for an individual, but a strategic necessity for a movement. I sat down with Professor Chenoweth to discuss how her work studying efforts to overthrow dictators abroad can relate to resisting Trump at home, and whether authoritarianism is rising in the United States. How do mobilizations like the Women’s March and the airport rallies impact the Trump administration? They signal that resistance to the administration’s plans is alive and well, and they signal this to lots of important audiences. The first audience is other would-be protesters, who may be more willing to participate as they see the movement growing and winning key gains. The second audience is the silent majority, who may see the protests and demonstrations as reason to interpret the Trump administration’s actions with more skepticism. The third audience is the people who actually implement policy—Congress, law-enforcement officials, civil servants, and others who may be involved—who see that implementing the policies might be too costly, thereby motivating them to resist internally. And the fourth audience is people observing abroad, who see the resistance as a sign that the preferences of the American electorate are actually quite different from those of the American president. Public resistance can help to temper the consequences of any reckless missteps from the administration. Do you consider Donald Trump to be an aspiring authoritarian? There are certainly demagogic aspects of his behavior: disregard for institutional limits of his own authority, disregard for democratic norms and human rights, bullying and threatening political opponents, scapegoating of the vulnerable, mischaracterizing opposition to his plans as treachery, and a seeming indifference to understanding the US Constitution. But it’s also important to recognize the broader authoritarian currents in the American polity that put him in power. What is the typical playbook of an authoritarian? There is a pretty typical authoritarian playbook when it comes to weakening civil society. It’s basically a divide-and-rule strategy. First there are strategies to reinforce elite loyalty through purges, paying off an inner entourage, and co-opting oppositionists through threats and bribes. Second, there are strategies to suppress or undermine opposition. This includes using direct violence against oppositionists or their associates, of course, but it also involves counter-mobilizing one’s own supporters, infiltrating the movement, expanding surveillance, using pseudo-legitimate laws and practices that criminalize or increase penalties for erstwhile legal behaviors, adding administrative, financial, or legal burdens to civil-society groups, and planting plainclothes police and agents provocateurs to push the opposition into chaotic and/or undisciplined behavior. Third, autocrats use strategies to reinforce support among the silent majority and other observers. This includes scapegoating foreigners and outsiders for domestic problems; mischaracterizing oppositionists as terrorists, traitors, coup plotters, “thugs,” or communists; censoring information or engaging in misinformation campaigns; and co-opting or bullying the independent media into submission. As authoritarians consolidate power, all of these behaviors tend to increase in frequency and intensity. What is civil resistance and how it is different than what we might consider typical rallies and marches? Civil resistance is a method of waging conflict where people use a wide variety of coordinated actions to disrupt and confront the opponent. There are many hundreds (or thousands) of techniques of civil resistance, which vary in their risk and disruptiveness. Actions like blockades, highway shutdowns, human barricades, and nonviolent occupations tend to involve higher risk and disruptiveness, whereas rallies and marches involve moderate risk and disruptiveness (depending on their size and the transgressiveness of their claims). What does the success of a civil-resistance movement depend on? Generally speaking, successful civil-resistance campaigns have four things in common: the continual growth of the number and diversity of participants; the ability to elicit loyalty shifts among the opponent elites and their supporters; the innovation of new methods rather than reliance on a single method; and the ability to remain resilient, disciplined, and united in the face of escalating repression. We’ve seen videos of bricks thrown at store windows and cars and other objects lit on fire at some protests. These acts of property destruction are sometimes defended by a small segment of activists in the name of “diversity of tactics.” Can you be for nonviolence and for a diversity of tactics? What’s at stake in this question for organizers? My take is that the widespread acceptance of “diversity of tactics” as a necessary or superior method of struggle compared to nonviolent discipline is misplaced. The most systematic studies on social movements in the US suggest that the technique has been politically counterproductive, even in cases where it had short-term tactical advantages. It has tended to alienate participants and would-be sympathizers, while undermining loyalty shifts among the opponent elites and increasing repression against movement activists and those they purported to represent. Studies in other contexts and my own work with Kurt Schock on violent flanks suggest that combining violent and nonviolent action has been counterproductive in many other contexts as well (i.e., in both democratic and authoritarian systems, among different types of movement claims, etc.). There have been longer-term consequences too, as these activities have tended to deepen movement fragmentation and polarization over time. This has increased the propensity for authoritarianism and civil war long after mass movements have ended. The approach undeniably has had short-term tactical advantages that many organizers take for granted. However, in the competition for legitimacy among the silent majority, these short-term tactical advantages have had long-term political costs that have been difficult to overcome. How does property destruction affect the success of a movement? A systematic survey on different public attitudes toward property destruction (among other tactics, like riots, protests, using graffiti, etc.) found that it is deeply unpopular in the United States. 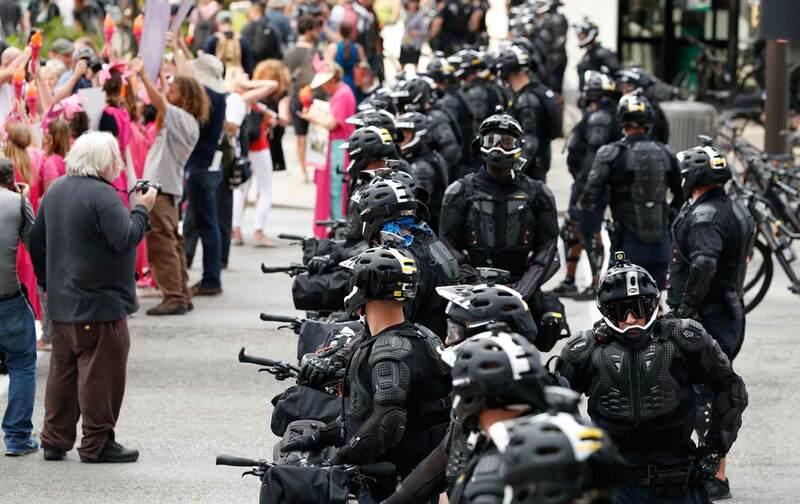 According to their surveys, the average white or Hispanic American believes that brutal forms of state violence (including the declaration of martial law, disappearances, and torture) are permissible when protesters engage in property destruction. Omar Wasow also looked at nonviolent protests versus riots and violent protest in the 1960s in the US (the latter of which often involved property destruction). He found that proximity to nonviolent protests increased white Democratic vote share, whereas proximity to violent protests caused substantively important declines and likely tipped the 1968 election from Hubert Humphrey to Richard Nixon. Tragically, we live in a country where many people have valued private property above human life. This ought to be contested and transformed. But this existing normative structure is an important part of the strategic operating environment, and it explains why so many studies have found property destruction to be counterproductive in terms of strategic success. What trends have you seen from your studies about when a movement begins to lose nonviolent discipline? Research finds that nonviolent discipline is more likely to slip away both when the opponent represses the movement and when it makes some midstream concessions to the movement. Repression can lead more militant voices to encourage the group to abandon nonviolent discipline out of a sense of desperation, whereas concessions can also split the movement into hard-liners and moderates, leading factions to spin out and form violent flanks. Many movements have successfully trained and avoided the breakdown of nonviolent discipline—and that this has allowed them to remain resilient (and therefore win in the end), despite the state’s attempts to divide and thwart them. It seems clear that Donald Trump and Steve Bannon are pursuing a “divide-and-conquer” strategy of polarization. Is it right to assume that Trump and Bannon are waiting for a war, terrorist attack, or riots, to justify increasing authoritarianism? What can organizers do before the administration employs such tactics? Any government could use such an action to justify increasing authoritarianism—whether it’s Trump’s administration or any other. A strong civil society can be an effective bulwark against authoritarianization. I believe that people in this country must protect and expand every bit of space they have to convene, talk, and build unity, solidarity, and capacity for the long haul. Of course, protests, marches, and rallies are opportunities for civil society to express itself. But, as Theda Skocpol argues, a strong civil society really comes from simple things like convening conversations over food, reading and study groups, encouraging involvement in various civic activities, community meetings, interfaith dialogues, and coalition-building. In many civil resistance campaigns around the world, we’ve seen the last stage of a movement through iconic images of security forces refusing to obey orders and deciding to side with civilians. While the US military is one of the most racially integrated institutions in our country, how will these dynamics play out in our politics and in our policing system which are highly racialized? In some systems, defections among security forces are impossible because of racial or ethnic divides. This was true in South Africa, for instance, where trying to elicit defections from security forces would have been disastrous (and incredibly dangerous) for black activists in the townships, particularly because of the tendency to view all black people as potential “terrorists” in the armed wing of the ANC. So instead, anti-apartheid mobilization aimed to hit the wallets of economic and business elites, and this was the crucial pillar of support that withdrew its cooperation from legalized apartheid as a result. One lesson from this and other cases abroad is that effective community organization and resilience, building strategies that identify various other targets and methods of pressure, and avoiding deliberately provocative confrontations with security forces whenever possible can help a movement win in the end, while reducing needless exposure to risk. There is strong evidence to suggest that the Americans view protest and policing through similarly racialized lenses. For instance, in recent survey research, many African Americans see all police violence against protesters as illegitimate. Conversely, many white Americans are more likely to interpret police violence as legitimate when it is directed against brown and black bodies, as compared with white bodies. However, when police are of mixed race and protesters are of mixed race, white Americans become confused and ambivalent about which side to support. There is an opening here to make them more sympathetic to the protesters. This racist status quo is unacceptable, and progressives must work to change it. But in the meantime, these findings reveal important practical considerations regarding the current American polity. First, the findings speak to the strategic value of white allies showing up in actions to confound observers who would otherwise support police brutality. The findings also speak to the wisdom of longer-term efforts by many communities to bring racial and ethnic diversity into their police forces. What do you think efforts to stop or remove Trump most depend on? Once democracies begin the slide into authoritarianism, institutions cannot save them. The only protection against total failure is the capacity of civil society to effectively mobilize collective action. So, basically, we’re it! The ability to protect (and improve) the republic depends on whether a diverse coalition of progressive groups can restore, sustain, and mobilize an effective civil society.